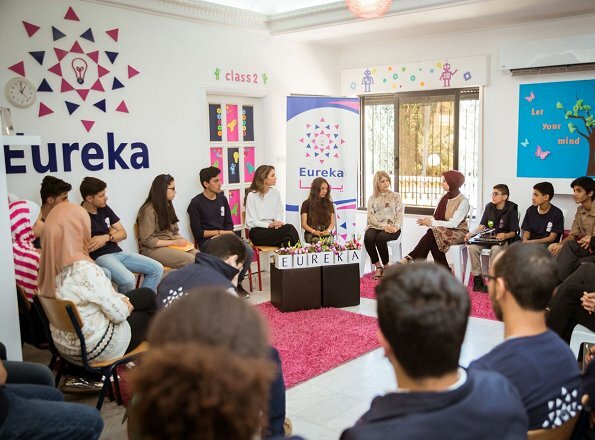 Queen Rania visited Eureka Tech Academy on Wednesday and met with academicians and students. Eureka Tech Academy is an organization which displays activities for the purpose of developing child skills in technology and engineering and is specialized in innovativeness and engineering. Has this queen ever worn the same clothes twice? I just can't recall it. Most totals do a little bit of reusing at least, some more than others, but had Rania ever? Probably, but I haven't noticed. Anyone knows? Yes she does recycle clothes. Not often but she does actually the blouse she wore has been worn it before. It is ok. I understood what you meant. For clothes, she doesnt often recycle sometime you will find Princess Iman and Salma wearing some of her clothes, for shoes, handbags, jewellery and accessories, she recycles them alot more. Awful baggy pants. Not sure I like the blouse. She has to eat a little bit more! rainha, that is a terribly mean and ignorant comment.